Fifa wants to reclaim "tens of millions of dollars" taken illegally by its members and other organisations. It also says corrupt officials who served on its former executive committee were guilty of selling their votes in World Cup bidding contests. Former officials Chuck Blazer, Jack Warner and Jeffrey Webb are among those being sued by Fifa, which has submitted documents to US authorities. In total, 41 individuals and entities have been charged in the States. Fifa estimates millions of dollars were diverted from the sport illegally through bribery, kickbacks and corrupt schemes carried out by the defendants. World football's governing body has been in turmoil since May 2015, when a US investigation exposed widespread corruption at the top of the organisation. Read: Who are the indicted Fifa officials? Now it is attempting to fight back, describing itself as a "victimised institution". New Fifa president Gianni Infantino, elected in February, also claimed corrupt officials had "abused positions of trust". He added: "They caused serious and lasting damage to Fifa, its member associations and the football community. "The monies they pocketed belonged to global football and were meant for the development and promotion of the game. "Fifa as the world governing body of football wants that money back and we are determined to get it no matter how long it takes." 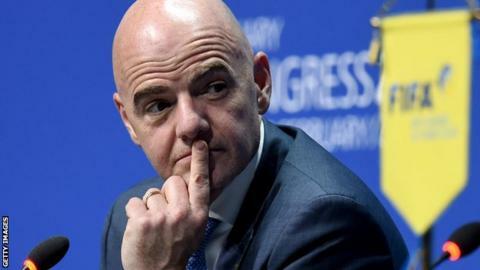 Once the money had been recovered, Infantino said it would be directed back to its original purpose of benefitting and developing international football. He added: "These dollars were meant to build football fields, not mansions and pools; to buy football kits, not jewellery and cars; and to fund youth player and coach development, not to underwrite lavish lifestyles for football and sports marketing executives." Infantino, 45, was elected as Fifa chief last month, replacing Sepp Blatter, who had been in charge of the governing body since 1998. Many critics will see this as Fifa effectively suing itself - a convenient and cynical act of hypocrisy, given the organisation's close historical links with the defendants it is now taking action against. But it should come as no surprise. Fifa's survival depends on it retaining the victim status afforded it by the US Department of Justice and this helps reinforce the narrative that it was the injured party in football's corruption scandal, rather than the perpetrator. With millions of dollars being spent each month on lawyers to clean up the scandal, as well as the loss of key sponsors, Fifa could do with the money. Significantly, it publicly accepts for the first time that some members of its executive committee regularly sold their votes and that South Africa's $10m payment to Warner and Blazer was indeed a bribe for the 2010 World Cup. Strangely, there is no mention of Russia 2018 and Qatar 2022, even though both Warner and Blazer were part of that controversial vote too. It is hard to imagine such an admission while Blatter was still in charge of Fifa, and Infantino will hope it helps him demonstrate that football's governing body has finally turned a corner.